This is an extremely nice no hit / no rust El Camino that received a comprehensive ground up restoration about 3 years / 2500 miles ago. 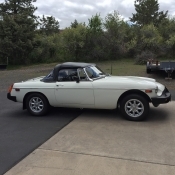 It spent the majority of its life in Kennewick, WA and was believed to be 87,000 original miles and only 3 owners prior to the restoration. Some records available. Drive Train: Matching number EE code 327 275 hp. The Powerglide transmission was replaced with a 200 4R overdrive transmission. It has the original 336 geared, non-posi rear end. All of the drive train components have been rebuilt. Front and rear sway bars were added along with 1 inch drop spindles in the front and 2 inch drop coils in the rear. American Racing wheels 17x7 and 17x8. Factory disc brake car with all new brakes front and rear. New dual exhaust with Flow Master mufflers and stainless tips. Body: The body was professionally painted with high quality Sikkens base coat / clear coat. New SS hood. All of the bed trim was replaced with GM NOS stainless moldings. The grill is NOS GM. All stainless window trim was polished to perfection. The body side moldings were polished and re-anodized. The original bumpers, exterior door handles and tail gate handle were all re-chromed at Oregon Plating before they closed. All of the emblems are NOS and were purchased from Gary Dunn Chevrolet Parts in Portland, Oregon. Very few aftermarket parts were used in this restoration. Interior: This is a factory air car and the factory air has been refurbished and works as it should. A very rare / original floor shift tilt steering column was located, rebuilt and installed. Bucket seats with new foam and high quality seat covers. New carpet with Dyna Mat installed. Horseshoe style floor shift console with correct overdrive indicator. The original radio was rebuilt and converted to an AM / FM with amplifier and the ability for audio in added. Front and rear Kenwood speakers. Original dash pad and headliner are in very good condition. All NEW tinted glass. After market 3 spoke steering wheel. Original style in dash tach instead of clock. Very nice car that needs nothing - everything works as it should. 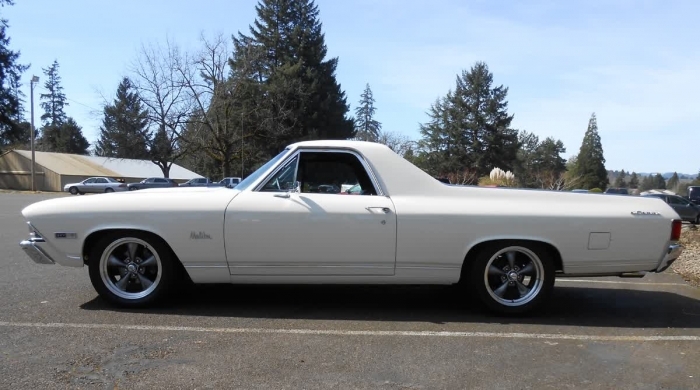 Not a cheap restoration and quite easily one of the nicest 1968 El Camino's to be found anywhere!